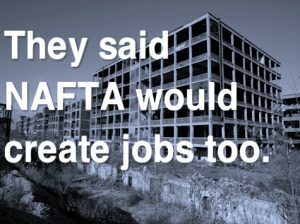 Many on the Left have been deeply critical of the North American Free Trade Agreement (NAFTA) since before it was fast-tracked into law by former President Bill Clinton in 1994. Now, President Donald Trump’s current plan to renegotiate NAFTA is poised to make the massive trade deal even worse. In late May, a loose coalition of civil society groups gathered in Mexico City to discuss this upcoming renegotiation. Participants included the AFL-CIO, Canadian Labour Congress and over one hundred other labour, environmental, and immigrant rights organizations from across Mexico, the United States and Canada. The meeting produced a joint declaration opposing a Trump-led NAFTA renegotiation and marked the kickoff of the latest international campaign against free-trade deals that benefit corporations and political elites at the expense of workers, communities and our shared environment. 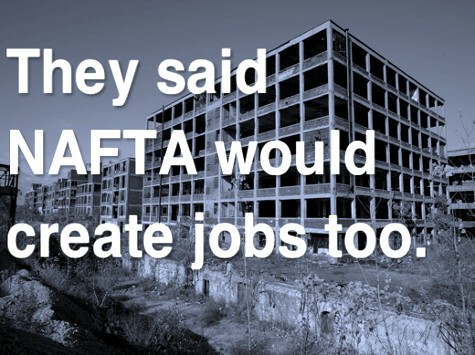 NAFTA’s legacy is marred by lost jobs, lower wages, increased inequality and a litany of environmentally destructive practices. While the people who gathered in Mexico City have long opposed NAFTA for its pro-corporate bent, a consensus emerged that President Trump and his team are cooking up something even worse. Two questions follow from this judgment: What can we do to stop Trump, and how can we use the moment to challenge the powerful interests that he represents? Trump campaigned and won the U.S. presidential election in no small part due to his anti-free-trade positions. He galvanized millions of voters for whom the considerable promises of globalization have long since given way to the stark realities of rising inequality and declining living standards. After assuming the presidency, Trump decided it was politically necessary to kill off the wildly neoliberal Trans-Pacific Partnership (TPP) to appease his popular base. This decision was met with dismay by nearly all big corporations and elites from both political parties. But now, in an act of political judo, Trump is trying to use the same anti-establishment, pro-American rhetoric from his campaign to craft a neoliberal NAFTA renegotiation that will include everything demanded in the recently scuttled TPP – and more. Commerce Secretary Wilbur Ross, as well as others in Trump’s administration, have been surprisingly straightforward about these intentions. Formal notice of the intent to renegotiate was submitted to Congress on May 18. Following an obligatory 90-day “consultation period,” negotiations are expected to commence in the second half of August. A draft list of the Trump administration’s priorities, submitted to Congress in late March, gives us a window into what we should expect. A Trump-led renegotiation will mean a strengthening of heinous Investor-State Dispute Settlement (ISDS) mechanisms, which allow corporations to sue governments that “infringe” on profit-making opportunities, for example, by daring to introduce anti-tobacco legislation. It will mean stronger copyright and intellectual property laws, in case you’re not already spending enough on your medications. It will also mean further privatization of the internet, greater corporate control of e-commerce, and most likely a new broadside against net neutrality. Meanwhile, “investor incentives” will increase the liberalization of capital flows and lead to the offshoring of many thousands of jobs, in the ongoing global race to find the most exploitative labour conditions possible. And, of course, this ceremony will be sealed with the ritual sacrifice of labour, human rights and environmental regulations in each of the three signatory countries. And let us not forget that, while the TPP accounted for 40 per cent of the world’s GDP, NAFTA still represents approximately 25 per cent. In 1994, NAFTA set the standard for two decades of terrible international trade agreements, and power brokers across the world hope this renegotiation will restore business as usual and set a new standard for decades to come. Given the power of the United States vis-à-vis its negotiating partners, this panorama might at first glance appear depressing. But we also should not forget the insurgent campaign of Democratic primary challenger Bernie Sanders, which brought together millions of people in opposition to these types of free trade deals. While there are major differences between Trump and Sanders voters, there is real agreement that these corporate-led deals are bad for ordinary people. Herein lies a real political opportunity that absolutely terrifies elites on both sides of the aisle. Around the NAFTA renegotiation there exists a genuine possibility, in an otherwise badly fractured political landscape, for a bipartisan consensus against corporate and elite power. Knowing that the renegotiation of NAFTA may well die at the ballot box – just as TPP and TTIP were killed off by popular demand in the past year – the main goal for its proponents is to conclude talks as quickly as possible. This has been stated clearly by lead trade representatives in each of the three countries. Now, the first major challenge comes not from the United States, but from Mexico. Mexican general elections are scheduled for July 2018, with primaries and the accompanying political jockeying beginning this fall. With President Enrique Peña Nieto’s approval ratings sinking below 20 per cent, the position of his “institutional revolutionary” PRI, which has dominated Mexican politics for nearly 100 years, is considered vulnerable. The early frontrunner for the upcoming presidential race, popular former Mexico City Mayor Andrés Manuel López Obrador, has staked out a populist, anti-establishment position that places greater emphasis on labour and environmental rights, as well as national sovereignty. As his campaign advances, he is widely expected to take aim at a U.S.-led NAFTA renegotiation as a winning political wedge issue. In this context, progressive groups opposed to a corporate-led NAFTA renegotiation must adopt the same strategy that was so successful in the battle against the TPP: throwing sand in the gears. While it was Trump who dealt the TPP its death blow, it was the hard work of progressive civil society that shed light on this secretive deal, slowed its advance and ultimately entangled it in the 2016 election – correctly anticipating that popular consensus would reject the agreement. In Mexico, this aim can be achieved by emphasizing Trump’s calls to “build the wall,” as well as his racist characterizations of Mexicans as rapists, criminals and job stealers. It can be done by pounding the suddenly-vulnerable Institutional Revolutionary Party (PRI) as a bunch of robber-baron elites who are looking for one last score before they are flushed from power. In Canada, a similar strategy can be pursued by emphasizing Prime Minister Justin Trudeau’s tendencies towards a politics of symbolic resistance and substantive acquiescence. In this style of governance there exists a gap that civil society can exploit. Trudeau very much values his carefully cultivated public image, but Canadians have seen the material impacts of NAFTA on their country, and they now oppose the deal by a four-to-one margin. In the United States, at least for now, the focus should be on the tremendous lack of transparency that has characterized early negotiations. 500 corporate trade advisors and TPP veterans are being actively consulted, while labour and civil society organizations remain completely shut out of the process. And of course, there is the historically unpopular figure of Trump himself. These are some of the early strategic lines for opposing NAFTA and contesting a Trump-led renegotiation. But to build a more integral politics beyond mere opposition, it behooves us to go a step further. If you accept the argument that trade policy could become a fertile terrain for growing new coalitions, it is only by articulating positive alternatives that we will be able to make these coalitions take root. We must begin with a political frame that creates space for Trump’s supporters without making any concessions around the xenophobic rhetoric that the President has thus far employed. This is not about Mexicans, or anybody else, stealing U.S. jobs. It is rather about big corporations and political elites excluding the rest of us – from all three countries – from our fair share of the pie. To create this broad space for political convergence, we must demand an open consultation process. This requires that labour and climate justice groups, rank-and-file workers, immigrants, farmworkers, and small and mid-sized business owners have an opportunity to weigh in with their concerns. In addition to these formal consultations, civil society should help to amplify these voices of concern through people’s tribunals and other public hearings. And this input should form the basis of an alternative vision for cooperation between the three countries. We should not meekly request that NAFTA’s unenforceable side agreements on labour and environmental standards be strengthened around the edges. Rather, we must demand that worker and climate justice in all three countries be built into the foundations of all subsequent commercial agreements. In addition, we must call for the deeply unpopular ISDS mechanisms to be either eliminated or opened up so that community groups, individuals and governments can bring lawsuits against corporations for labour and environmental malfeasance. Consumer protection must replace corporate interests as the principal factor in the renegotiation of intellectual property laws, as well as the coming regulation of e-commerce. Investor incentives should be vanquished, and instead of simply requesting that we “buy (corporate) American,” we should demand that all three countries “buy union,” that they buy sustainably, and that they support local, social and solidarity economies when possible. Prominent labour, fair trade and environmental groups have outlined these and other demands in great detail. Crucially, these proposals are broadly popular with the majority of people in all three countries. The upcoming NAFTA fight thus presents an opportunity to deal a blow to Trump’s xenophobic rhetoric and neoliberal blueprint – and to begin the hard work of forging a new progressive consensus. Ethan Earle is a project manager for the Rosa Luxemburg Stiftung—New York Office. Follow him on Twitter at @EthanEarle. Originally published at InTheseTimes.com .